Building on our successful camps this summer, the Hellertown Area Library has graciously agreed to host a second round of fiction writing workshops. On Wednesday, November 15, I’ll be teaching an after-school workshop from 3:45 to 4:45 for students in Grades 4-8., and on Monday, November 13, I’ll be leading an evening workshop from 6:00-8:00 for teens and adults. Both new students and repeats are welcome! Please email me at joe@joeharvey.net for more information, or contact the Hellertown Library to reserve your spot! Email: eclavier@hellertownlibrary.org or Phone: 610-838-8381. These past few years have been a whirlwind! Since Sunbury Press published From Blue Ground in December 2015, I’ve gotten to experience many things I never imagined I’d do. From attending conferences, book fairs, and book signings (one with the former Lt. Governor of Pennsylvania) to speaking at school author visits and writing workshops, it’s been quite a learning experience, to say the least! One of the things I’ve learned over the past couple of years is that writing a book is the easy (and fun) part! Promoting and selling it is hard! I’m not a natural salesperson, and I generally dislike self-promotion. I’d rather sit on my deck by the pool (or, better yet, next to the ocean) and listen to the trees sway (or the waves crash) and write! 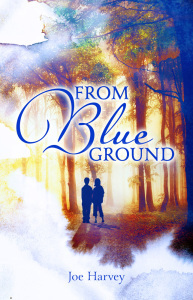 But, one of the best things about getting out there and promoting From Blue Ground has been all the supportive people I’ve met both in person and online. I want to thank you for your support, for buying and reading my book, and for recommending it to your friends and family. What your support means to me is beyond words. As many of you know, this coming February 2018, Sunbury Press will release my second book, a novel for young adults called Summer Changes Everything. It tells the story of troubled teen Dylan Martin, and how one person can make all the difference in someone’s life. For Dylan, meeting his first love becomes a life-changing experience for him. The book is dedicated to my wife, Kara. I hope you’ll read it and enjoy it as much as I did writing it. Now comes the hard part: getting the book into the hands of people who’ll read it! I know that all of you, my steadfast supporters, will be among the first to buy a copy, and I thank you for that in advance from the bottom of my heart. Now I’d like to humbly ask if you wouldn’t mind going a step further? One of the best things you can do to support me is to recommend my books to a friend or to others who you think might enjoy them. In today’s digital world, that means going online. More and more, people rely on recommendations from websites like Amazon and Goodreads to help them decide what to read and buy next. The more reviews, the better. On Amazon, it takes 50 reviews in order for Amazon to recommend that book to shoppers browsing for products online. I’m looking for a group of dedicated supporters to read an advanced copy of my next book, Summer Changes Everything, in the hopes that you will show your support and submit an honest review. My publisher, Sunbury Press, uses a website called NetGalley to help kickstart and manage these coveted reviews. NetGalley is a service that promotes and publicizes forthcoming titles to readers of influence, like you. Once you’re a member of NetGalley, you’ll be able to request, read, and recommend my book before its published, which will create a buzz and encourage others to buy it. Since NetGalley works in a digital format, you’ll be able to download the book onto any major reading device or tablet (Kindle, iPad, Nook, iPhone, or Android device). The best part about it is it’s free. You’ll receive a free digital copy of the book before it’s even published! Now, I hope you’ll still support me, your struggling author friend, and purchase a paper copy as well. (I’ll even sign it for you lol!) I would be forever grateful! If you’re interested in helping me in this endeavor, please click here, fill out the information, and I’ll get you started! Thank you so much for your support! Come visit Sunbury Press authors Joe Harvey and Tory Gates at the 50th Annual Keystone State Reading Association Conference on October 9! They’ll be signing books at Table 36!